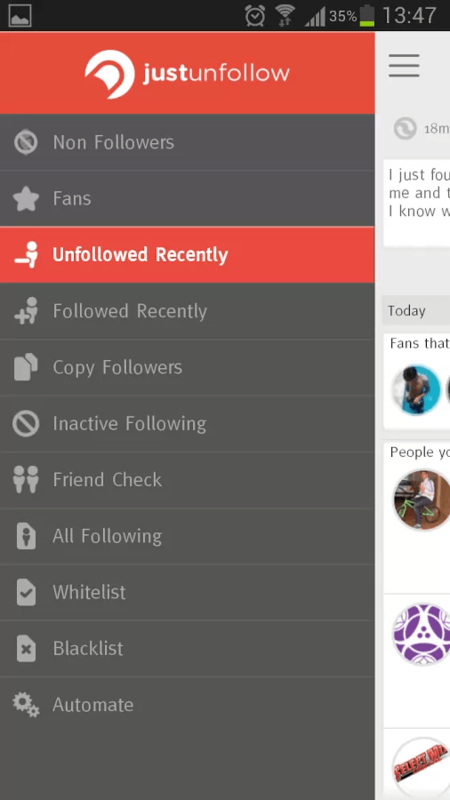 Did you know that you can actually track your Twitter and Instagram unfollowers? If you are using an Android device, there are simple apps that you can use to easily manage your social media accounts. One good example is the JustUnfollow app. Limited follow/unfollow rate – you can only follow or unfollow up to 50 Twitter users per day and up to 60 Instagram users per hour. If you want unlimited access, you can opt to upgrade any of your linked Twitter accounts to Premium – $4.99 for 1 Twitter account. What’s great about the JustUnfollow app is that it is very easy to use plus it features a well-designed and responsive UI. Right after you launch the app, you can immediately add your Twitter and Instagram accounts. It is also good to know that this app supports multiple user accounts so you can easily switch from one account to another. Since what this app basically does is to help you keep track of your Twitter and Instagram followers and unfollowers, you can simply swipe its screen to the right to view its menu. 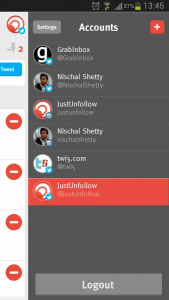 For Twitter users, you can track your non-followers, unfollowers, inactive followers, etc. within just a matter of minutes. The same goes for those who want to keep track of their Instagram followers, non-followers and fans. What makes this app even more interesting is the fact that you can also send automated direct messages to your new Twitter followers. Automated DMs are very helpful especially if you want to establish rapport to your followers and fans. You can also make use of this app’s “Friend Check” feature to check if a particular Instagram or Twitter user is following you and vice-versa. Just like any other apps, JustUnfollow also has its own downsides. First, its “Friend Check” feature for Twitter doesn’t work. You cannot type on its friend check box. Other than this, the automated DMs that you will send to your new followers will always have the “via Justfollow.com” tag and it can only be removed if you choose to upgrade your Twitter account. There’s also a limit to the number of Twitter and Instagram users that you can follow or unfollow. For Twitter, the limit is 50 users per day while the limit for Instagram is 60 users per hour. Of course, this limit can be lifted if you upgrade to premium which means that you need to pay $4.99 for one account. So if you have three accounts, you need to pay $14.97 and so on. Nonetheless, I did not encounter any serious issues with this app. As a matter of fact, it’s very straightforward. It does what it is supposed to do and it’s great for active social media users who have more than one Twitter or Instagram accounts. This app is also ideal for companies, businesses, bloggers and internet marketers. JustUnfollow app for Android is a very handy tool if you want to keep your Twitter and Instagram accounts free from fake followers. It also helps you determine the users who are actively following your tweets so it is easier to build a market wherein you can promote and sell your services and products. Plus, it helps you track who unfollowed you. This app may have a couple of drawbacks but its pros have definitely outweighed its cons. Check it out.